EV Grieve: 1 7-Eleven down, 113 to go! 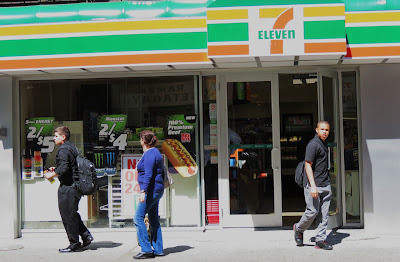 The 7-Eleven on St. Mark's Place opened Wednesday. We weren't actually going to mention it, but then several readers were like, "You aren't actually going to mention it? You did 500 posts on it until this point." So, here (or up there), for the record. At least 114 7-Eleven stores are set to open in Manhattan over the next five years, more than six times the number already here. Photo yesterday by Bobby Williams.